This blinkered, rigid 'philosophical' idea that food shouldn't be played with is quite awful. It pains me to read the silly opinions of people whose minds have been captured by ideas with no rational basis. These are the 'can't' people. They are everywhere but tragically they abound in education. What reasonable explanation can a child comprehend about why it is bad to play with food? Bad to make play dough; bad to use eggs or flour to make sticky pastes from which you can then create all sorts of weird and wonderful structures; bad to use food colourings and vegetables to make fantastic wallpaper; bad to use macaroni to make colourful necklaces; bad to use carrots to make snowmen noses; bad to use icing sugar to depict snow on wintry painting - the list is endless. If they don't get a good reason they either get resentful and rebellious or just repeat the stupid one and so the stupidity stretches on . I am not at one with the world today. Probably never have been and never will be. The thinking and actions of too many people just goes from bad to worse. I'm going out with my dogs. Their behaviour makes more sense to me than that of some supposedly intelligent human-beings. Jacinda Ardern, Labour spokesperson for welfare, wrote an article , Welfare of the nation, which appeared in last week's Truth. Note she starts with her own door-knocking story which counteracts David Shearer's now infamous roof painter on a benefit (more evidence of the ideological split on welfare currently dividing Labour). Door knocking in an area with low electoral enrolment last year, I met a woman who was ecstatic I could enrol her. When I asked what occupation she would like listed, she dropped her head and said: “I was a receptionist, but I’m a bit sick right now. I start chemotherapy soon. I’m so sorry”. I asked her why she was apologising and she replied “because I’m on a benefit”. Nothing indicates to me more that something is wrong with our welfare system than when those who need help apologise for receiving it, and the minority who don’t need the support, but get it all the same, are portrayed as the norm. The concept of the system hasn’t actually changed all that much since 1938, when the unemployment benefit was made available to anyone who was “unemployed, is capable of and willing to undertake suitable work, and has taken reasonable steps to secure employment”. It was a social contract. Everyone paid into a collective pot, and if you fell ill or lost your job, you drew from the pot until you found work again. Simple. The concept remains unchanged, but not our perception of it. Why? And how do we restore the notion of true social security? The concept does not remain unchanged though. For starters, today "everyone" does not pay "into a collective pot" before they have access to a benefit. Thousands of teenagers start life there and stay year after year. Also, as I have demonstrated before, pre 1970s people had to be of sober habits, good moral character and not have induced their own incapacity to work. And before the 1970s the DPB - in terms of dependence, now the single biggest benefit type - did not exist. Hence it is not a "minority who don't need support" - it's a majority. Not if you define support the way it was defined at the outset of social security. To say all people on a benefit have chosen welfare as a ‘lifestyle’ is way off the mark. We know Kiwis want to work – the queues of people who turn up for jobs at supermarkets are evidence of that. There are 112,000 sole parents on the Domestic Purposes Benefit. Most come off it within four years. The overall rate fluctuates very little, although the Ministry of Social Development predicts that the Government’s costly welfare reforms will still see more people on the DPB than when the Government started. In 2009, IRD surveyed why people on government support struggle to get off it. The first reason was job availability. Numbers two and three? Whether they had the right skills, and could cover childcare costs. These are legitimate issues. A sole parent on the DPB receives $293 per week before housing assistance. If they find part-time work, they can apply for help with child care and receive a maximum of $3.91 per hour. If you’re moving into a minimum wage job that has curious hours and requires either a babysitter or childcare, it has the potential to wipe out your wages from day one. Who is saying "all" people on a benefit have chosen welfare as a 'lifestyle'? We all know that there are people with terminal illnesses, people made redundant or people born intellectually disabled who need support. And most people appear happy with paying taxes to provide it.
" just over half had spent at least 80% of the history period observed (the previous 10 years in most cases) supported by main benefits." Next, if people came off the DPB when jobs were available how come when NZ had the lowest unemployment in the world (2007) the numbers only just dipped below 100,000? Then she emphasises the weekly payment of $293. Add to this the average weekly accommodation supplement and average family tax credit and the sum is $519 per week. And the IWTC that Labour now wants to abolish was exactly about preventing moving into work having "the potential to wipe out your wages from day one". Honestly, she is stupid. It’s time to revive Michael Joseph Savage’s philosophy and create a social security system minus the shame. 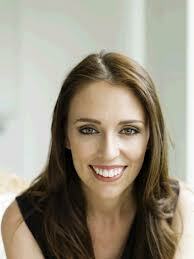 Be careful watch you wish for there Jacinda. Savage's system was based on the concept of the deserving and non-deserving. Whereas you and your comrade Deborah Russell want it to be free from any notion of worthiness. Make your mind up. Incomes fell for deciles 3-6 … but rose for the top decile especially. At the very bottom incomes were flat (protected by benefit rates being CPI adjusted and NZS being wage related). Inequality rose to its highest level ever [but] redistribution through the tax and transfer system reduces inequality very significantly compared with what it would otherwise be. An example is that single-earner two-child families with income less than around $55,000 from wages pay no net income tax. They receive more from WFF tax credits than they pay in income tax and ACC. Child poverty rates were flat from 2009 to 2011 – this is a good result in the circumstances. 50% of poor children are Maori/Pacific. 50% of poor children are from sole parent families and 50% from two parent. Income poverty rates for single person working-age households trebled from the 1980s to 2007 (10% to 30%) and were 35% in 2011. The Danish figure for percentage of teen pregnancies aborted is very high. I don't know, but it may be similar in other Scandinavian countries because they have similar low teenage birth rates. Paradoxically it is those teenagers who stand to lose the most by having a baby that avoid giving birth. Those who believe their (economic) life chances are slender continue with the pregnancy (generalising here you understand). 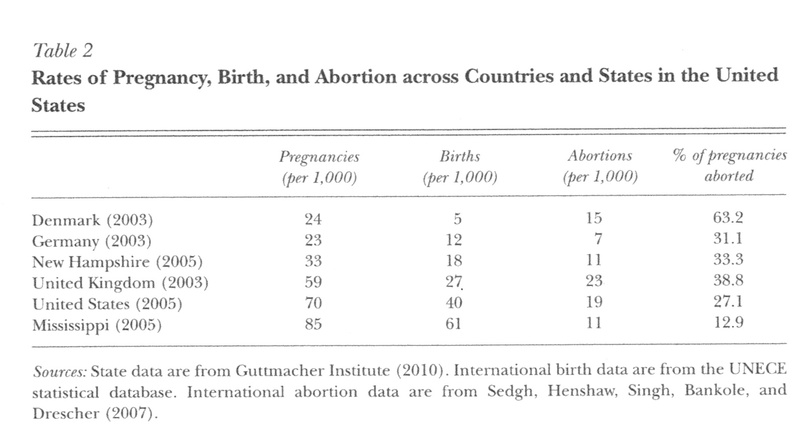 Trying to slot NZ in there, in 2010 (our birth and abortion statistics have improved recently) there were 28 births per 1,000 15-19 year-olds and 22 abortions. This lines us up closely with the United Kingdom in 2003. 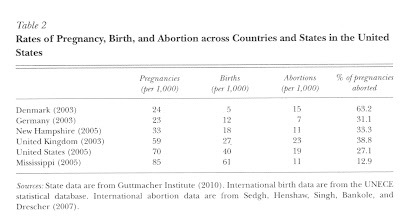 So, assuming the miscarriage rate is also similar, 37 percent of teen pregnancies in NZ in 2010 ended in abortion. A long way off Denmark. I am emotionally averse to abortion but when it means subsequent births result in children born to people ready, able and wanting to become parents the incidence of it is ameliorated. "Why we are all beneficiaries of the welfare state"
But when we criticise people who receive welfare, we are not just imprudent. We also undermine the security of our friends and family members and fellow citizens who depend on the welfare system. Our health and welfare systems are based on need, not some notion of worthiness. The first thing that came to mind was Benjamin Franklin's quote, "Those who would sacrifice freedom for security deserve neither." People are hardly free when compelled to pay tax for systems they neither approve of nor use. Those making the largest tax contribution are often also paying for private health and education and would never qualify for a welfare benefit due to means-testing. So it is farcical to claim that, " ....we are all beneficiaries of the welfare state." Worse, many beneficiaries do not feel free; they feel trapped and forgotten. They are living at a subsistence level in substandard housing due to their safety net now being called upon by one in eight working-age New Zealanders. The welfare system has created so much contrived 'need' (consider Russell's example of teenage sole parents), real adversity and emergency cannot be adequately met. It is not a noble idea that the welfare system is no longer based on some "notion of worthiness". It used to be. That was how the architects designed it. Otherwise the system would be open to abuse. As it now is. But the worst aspect of this academician's position is her cautioning against criticism of the welfare system. Is this how she teaches her students? My Truth column from August 9 is now on-line. In 2004 the Civil Union Bill was bitterly contested. Conservatives lobbied MPs furiously to prevent gays from forming state sanctioned and recognised partnerships. Even parties were split on the issue – ACT for example – although United Future members were unanimous in their opposition. The bill passed into law narrowly. Just eight years later a new bill to legislate for gay marriage seems to be stirring far less division and looks like having the numbers to pass into law. Even lone surviving United future MP, Peter Dunne, is indicating support for it. That’s quite a sea change. Society can change quite rapidly. Emotions burn out. Or people see incremental change, realise the sky hasn’t fallen and are then amenable to more. It is my fervent hope that the same attitudinal shift will have occurred to views about voluntary euthanasia. Labour MP Maryan Street currently has an End of Life Choice Bill in the ballot. The last time Parliament debated this issue was 2003. Then, New Zealand First’s Death With Dignity Bill was voted down 60-57. NZ First social policy spokeswoman Asenati Lole-Taylor said it was difficult to justify the amount of public money spent on vasectomies. "Why should the population in New Zealand pay for something that is supposed to be a personal expense? It's astounding really. Who cares how much WINZ spends on vasectomies so long as they don't spend money on reversing them! But if we accept the NZ First argument, where does the line get drawn on what "is supposed to be a personal expense"? What about raising your children? Paying your rent? Do you suppose that NZ First are launching an attack on all welfare? Because that's going to look pretty funny up against the privileges pumped out under the Super Gold Card. Generally I am against the "spend now to save later" arguments so loved by the Left. Too often there are those unintended consequences, and it's a licence to ramp up spending enormously in the here and now when there is no guarantee there will be a later saving. But as vasectomies do provide an almost 100 percent certainty of future saving I can make an exception. Is it just that I am so brow-beaten over the issue of racial discrimination that when I get to the following paragraph it feels as though, as a European, I am being castigated for being under-represented in prison? Despite Europeans making up 68 per cent of the population, only 33 per cent of those in prison are Europeans. That compares with 49 per cent Maori and 11.3 per cent Pacific - yet they make up only 15 per cent and 7 per cent respectively of the overall population. If I put that aside and actually engage with the 'accusation' Maori and Pacific both have young populations and so you could expect some slight over-representation, which is what we see with Pacific. But not gross over-representation, which is what we see with Maori. Why isn't some thought given to that difference. In the report's terms, why does the justice system let down Maori in a way that it isn't letting down Pacific people? And as always, when these sorts of reports make it into mainstream media and are widely broadcast on the TV, I worry about the message they send to subjects of them. It'd be like me telling my kids that whenever they have a problem, it's not their fault. They know however I am far more objective that that. Loving them doesn't mean I can't see their weaknesses. But it does mean that I have to help them overcome those weaknesses in anyway I can.